I did 10 times. But Can't Solve this problem. Need more retry? Can I sure perfect wiring between RP2 and Pogoplug E2? I think there are some timing problems, i´ll try to find a solution, please have patience. Hello, first of all thanks for this great tutorial. I have done everything up to the NAND PROBE part of the T2 (Telnet). Tried again from the start several times but I always get the same message. It is my Pogoplug memory burnt? Any news on this topic??? Good news, i got it working. It was a timing and reset problem. Update2: discription on page 1 is up to date now! + update uboot / uboot-env to the latest version from bodhi. Edited 15 time(s). Last edit at 03/14/2016 12:18PM by joerg_999. Does this work on Dockstar Also? > Does this work on Dockstar Also? Yes, should also work on a dockstar but you´ve to use dockstar.cfg from member z3bram3n some posts above. You also have to use the fitting uboot files for dockstar, envs are the same. Edited 2 time(s). Last edit at 04/19/2016 02:57AM by joerg_999. at first: i was able to reflash an iomega iconnect with this method in the last summer. Now I`m trying to reflash a used Zyxel NSA 325V1, bought on ebay. Serial console shows no sign of life, the system seems to reboot after around 30 s.
Kwboot is possible, Bodhi`s uboot was sent completely, then a single cryptic character returned, nothing further happened. Exactly the same behaviour with an uBoot-file from ArchLinux too. With both files there was no reboot after the 30s however. command before was done succesfully. How can i bring the watchdog to a hold-state ? Edited 4 time(s). Last edit at 12/17/2016 02:21PM by bodhi. > seems to reboot after around 30 s.
Yes. Watchdog kicks in at 30s. > returned, nothing further happened. I've seen a bricked NSA325 board behaves similarly, but the watchdog still kicks in at 30s. Just no serial console input/output. Ah. My u-boot has the watchdog killed right away, so that's why it did not run. It looks good to get here so far. > command before was done succesfully. Did you erase mtd0 successfully? I did not quite follow what you said. > How can i bring the watchdog to a hold-state ? Could you post the entire JTAG log session here? and also include the content of any cfg files that you are using. I might need to look at my saved log to see how to write a command turn off the watchdog at console prompt. I'm trying to use this howto to debrick my dockstar. ## Raspi ## Note: be careful and don´t mix GPIO and Pin number on Raspi! Perhaps CLK is TCK and RES is n_TRST? Sorry, but I don't understand the correspondence in that message. Where are the JTAGs pins for my raspi in that message? I have six wires to make six connections. 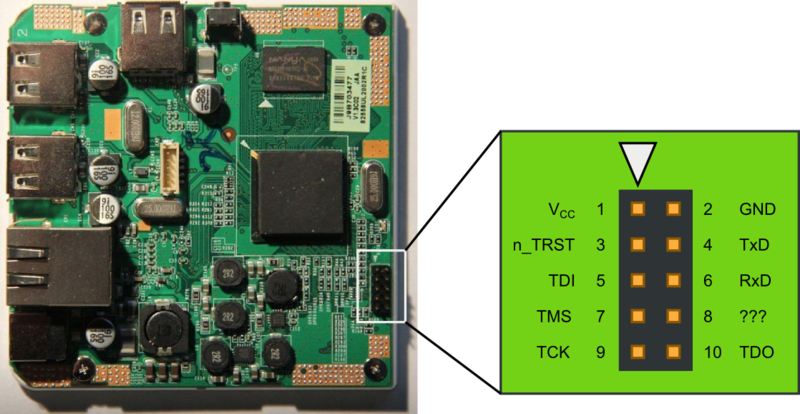 I have pin numbers for the dockstar in the message, but where are the pin numbers for the JTAG in the raspberry pi? Finally I was able to find out the connections I had to made. Everything worked perfectly!! My dockstar is debricked! Here is a picture of the hack. Thanks to joerg_999 and bodhi. I´m happy that your dockstar is back in live now. Hello guys I have a problem trying to write the nand file uboot. Edited 5 time(s). Last edit at 02/15/2017 07:26AM by ueghio. Edited 1 time(s). Last edit at 02/22/2017 01:43AM by joerg_999. dear joerg, the image of connexion to pogo is missing. can you attached again here? > ing. can you attached again here? of course, dropbox have changed something with my public folder, i will resend the pictures links. Edited 2 time(s). Last edit at 04/13/2017 12:50AM by joerg_999. I have created a new topic, because my problem is not specifically due to Raspberry, but I'm trying to recover a bricked dockstar and it doesn't works as expected, neither with a Raspberry, neither with a Bus Pirate cards. Whether with Bus Pirate or with Raspberry Pi. I've run your software with the Pi 3 Version B, hooked up the JTAG connections etc. and this is my output... any clues on how to proceed beyond the Telnet session error listed below (failed to halt)? I've tried the 200 Khz speed, and the Pogo reset button to no avail. Thanks again! after a long time i have a little bit time again for the nsa325v1. It is not possible to write into the flash, all other commands and their outputs are ok.
Loading the uboot into the ram however seems to be ok. But how can I execute/start it from the ram then ? Edited 1 time(s). Last edit at 03/14/2018 02:29PM by dietgert. I have started working on my bricked dockstar with an "Altera Usb Blaster" Clone (ca 6 € from Amazon) with minimal success. After getting connected to the target via JTAG (USB Blaster with openocd 0.10 on Linux Mint PC), and successfully setting Processor to halted in ARM-State. "nand probe 0" returns "unknown manufacturer 0x00 0x00". EDIT: Took a "synthesis" of two configurations (look after routine dockstar_init in thread) and it works! "NAND flash device 'NAND 256MiB 3.3V 8-bit (Micron)' found"
Edited 1 time(s). Last edit at 10/14/2018 11:53AM by Martin aus Dortmund. Is there any tool out there to update the crc of the changed environment image? Edited 2 time(s). Last edit at 10/14/2018 03:00PM by Martin aus Dortmund. > the changed environment image?